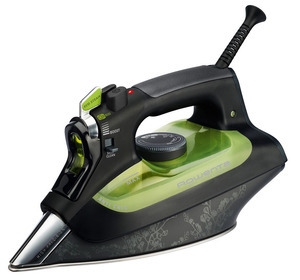 The Eco Steam System delivers an optimal steam output to iron efficiently all fabrics while saving energy. The 3De soleplate helps concentrate steam and reduces losses. The steam use is optimized and allows same ironing results as a regular Focus iron, but with less steam. 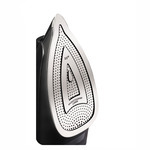 Measures 12.5" x 5.67" x 7.1"
A revolutionary, energy saving iron that reduces the energy consumption of an iron while maintaining professional and efficient quality. Exclusive steam optimization system offering 3 settings, including Dry Eco and Boost. Integrated anti-scale system removes impurities for a long-lasting, clean steam. With a soft grip handle and a large soft-touch rear that provides extra stability when iron is on its heel. Weights 6 lb. 1700 Wattage. Made in Germany. Freight Intensive Billable transportation charges for freight intensive items will be the greater of the dimensional weight compared to the actual weight. In addition to transportation charges freight carriers may assess an additional oversize charge per package. 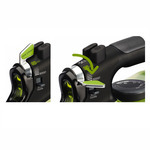 3 Way Auto Shut Off Automatically turns itself off after 8 minutes vertically, or 30 seconds when flat or tipped over. 400 hole Microsteam Soleplate Microsteam holes help perfect steam distribution. Vertical Steam Allows iron to be used in an upright position to remove wrinkles from hanging garments. Enhanced Stainless Steel Precision Tip: Enables easy access in hard to reach areas. This is a great feature for narrow edges, seams and collars. Pleasure to deal with, beat competers price. The iron is much heavier than I thought it would be.